I’m not sure whether to file this under Breakfasts or Desserts…..but I am sure that this is my favorite, creamiest, thickest French Toast ever. An agave, vanilla flavored custard soaks into the bread and creates a soft bread pudding center, with a buttery crispy crust. With lots and lots of hearts……. First, I get all of the garnishes and toppings ready because when the toast is done and warm, I’ll want to plate everything fairly quickly. 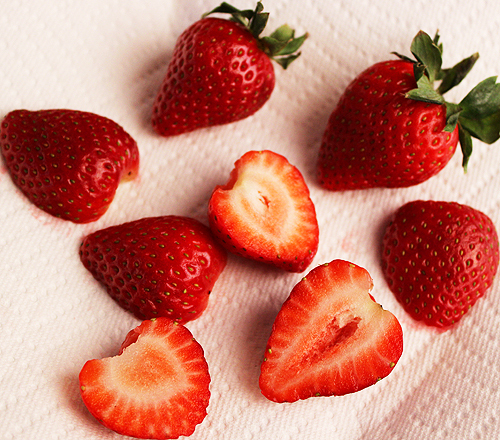 Strawberry hearts……I look for the ones with the perfect pointed bottom. And try not to blunt cut the tops like this. 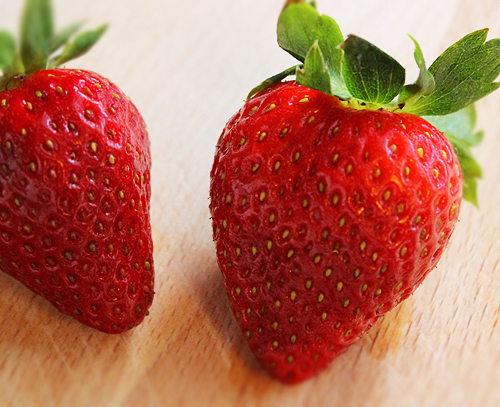 By removing the stems and slicing a few in half……instant sweet ‘be mine’ berries! My sweetheart is a huge bacon fan. 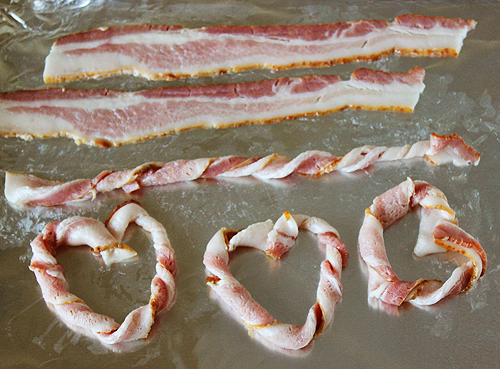 For bacon hearts I take each strip and twist it into a rope, then form the heart. The twisting seems to hold them together better, pinched where the ends meet. Baked at 400 degrees for 25 minutes or so………..
Crispy salty bites. And if a couple should open up and lose their shape? Just say that you meant to do that. Because when you ‘keep your heart open, love will always find its way in’…..like the parade of Jane Seymour open heart necklace commercials we see on TV this time of year. 1/4 cup of your favorite maple syrup, add the spices over medium low heat, just to warm and smooth. Cover with a lid and set aside until plating. A simple step that adds huge flavor. Note: One pinch of cayenne gives a lovely bit of heat, so use your judgement when adding, little by little, until it’s just like you like it. A thick loaf of country white bread. I let the whole loaf sit out on my cutting board overnight because stale bread holds together better for the custard soak. Cut into four 1 1/2 inch slices. This thickness will result in a gorgeous bread pudding consistency. More hearts! 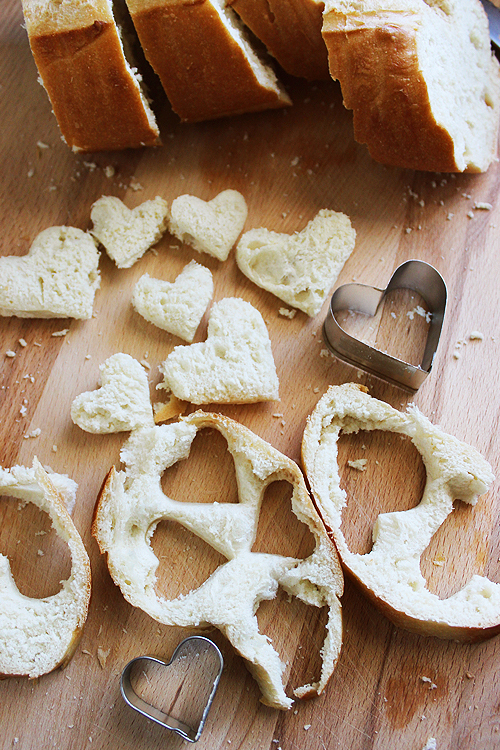 Cut a few more slices of bread to 3/4 inch thickness, and use different sized heart cookie cutters (if you have them.) Or create free-style heart cut-outs that can be even more whimsical and interesting. Note: save the bread scraps for later, they make for great homemade croutons. The custard mixture……hello lover! I normally use whole milk. Sometimes I use half-n-half. Today I used a combination of whole milk and heavy whipping cream. 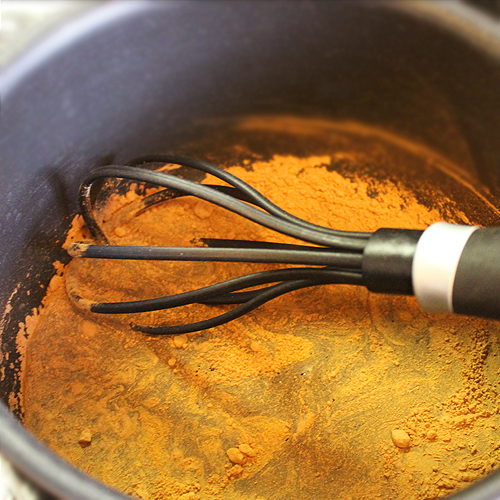 Whisked with 3 eggs, agave syrup, vanilla and a pinch of salt. The bread, even though it’s stale, will only need a 30 second soak. It goes into the custard, flip a couple times to coat, then into the buttery heated pan to cook. If you’re using a more dense bread like a challah or a heavy raisin nut, let it soak a bit longer, maybe a minute. You can feel and tell when it’s properly saturated. What you don’t want is instant pudding in your hands. Into the pan. 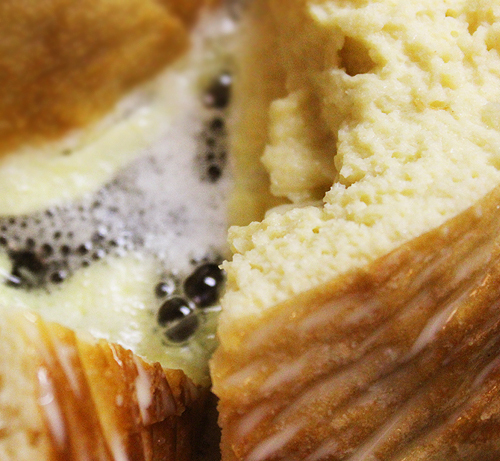 Right away the butter will bubble, and the vanilla custard will make your kitchen smell like the best bakery in town. When the toast is golden on the bottom, typically 4 – 6 minutes on medium low heat, flip them. 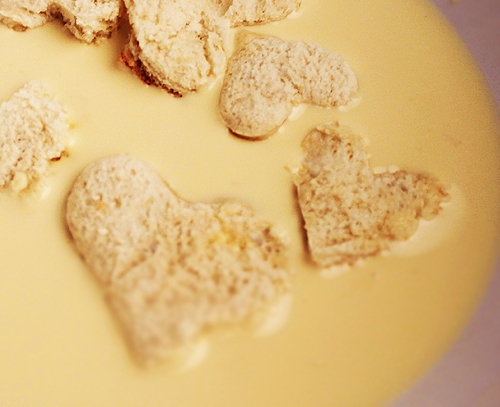 Dip the small bread hearts into the custard, move them around with a fork and place into the pan. Cook the hearts a couple minutes, one minute for each side…..
….they will finish cooking first. Move them to a plate with your other garnishes, then continue to cook and lift the toasts up with a spatula, often, to check for browning. Repeat for the remaining toasts. Note: consider cutting one of the large toasts in half to create more shapes for plating. Have fun with this! Pile the toasts around the plate or stack them high. 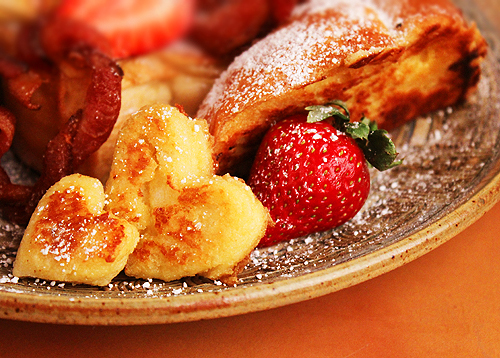 Place the toast hearts, strawberries and bacon hearts wherever they look right to you. Let your artsy Valentine self come out to play. Then let it snow with a sifting of powdered sugar. 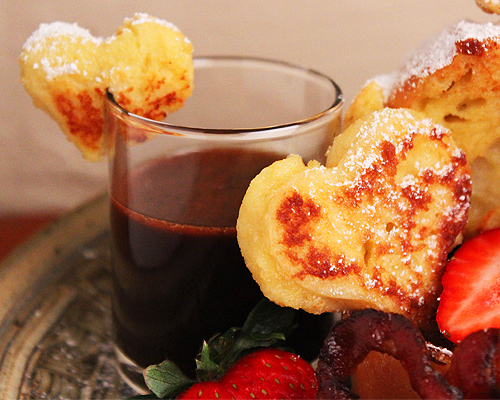 With cocoa cinnamon cayenne syrup to pour over the whole love-on-a-dish. 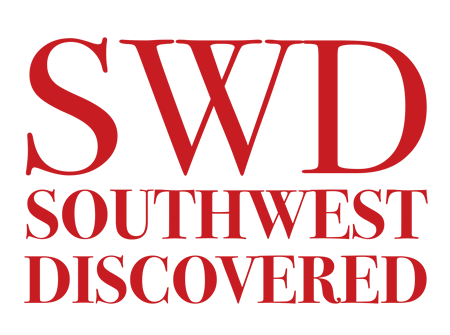 You’ve got a lot of bite-sized tidbits here ….. just sayin’ ….. lends itself to feeding them to each other! Wishing you Valentine’s lovey-doveyness all year long! Makes 2 Large Servings, or 4 Regular Portions. Leave the loaf of bread out, uncovered, overnight. 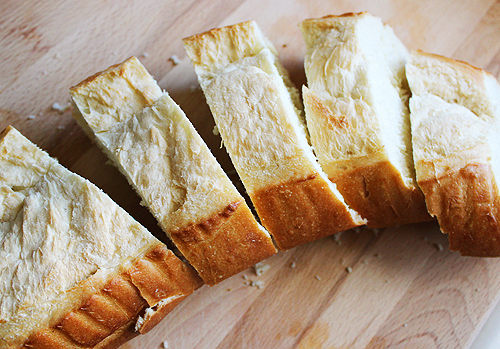 Stale bread holds together better for this recipe. 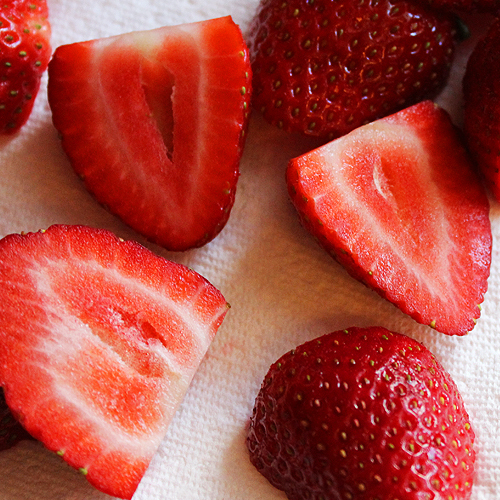 Wash and prep the strawberries. Rather than blunt cutting off the tops, remove the stems gently with your fingers or a paring knife. Cut a few in half, keeping their heart shapes. 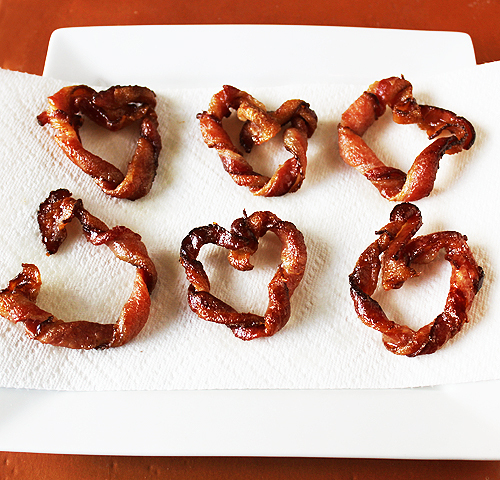 To create the bacon hearts, take each strip of bacon and twist into a rope. 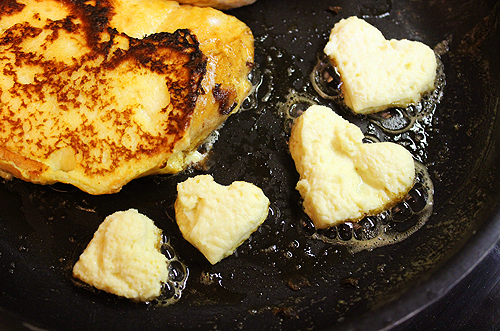 Place on a baking pan and shape it into a heart, pinching and wrapping the ends together. Repeat for the rest. Place in a 400 degree oven for 25 minutes or until crisped. Remove and let drain on paper towels. Set aside. 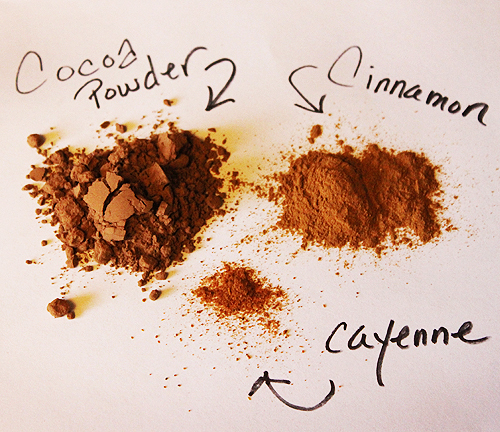 For the syrup, bring the maple syrup, cocoa powder, cinnamon and cayenne to medium heat in a saucepan. Stir until warmed and smooth. Cover with a lid and set aside off heat until ready to plate. Place the stale loaf of bread onto a cutting board. Cut 4 pieces to 1 1/2 inch thickness. These are for the large toasts. 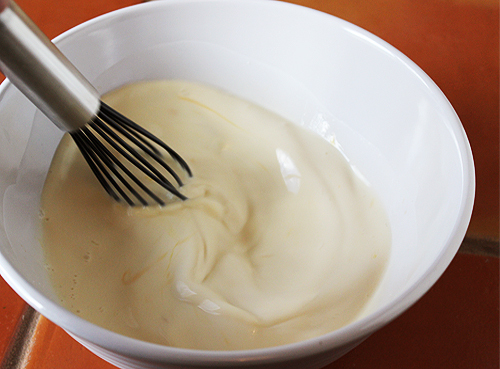 Mix the custard in a medium bowl by whisking the milk, cream, eggs, agave and salt. A wide bowl is best for dunking the bread. Or, transfer the custard into a 9x9 inch backing dish. Bring 2 tablespoons butter to medium low heat in a large non-stick saute pan. Soak the large bread slices for 30 seconds in the custard, turning a few times, so they are just saturated but not turning into 'pudding.' Even though the bread is stale, they won't need long to soak up the liquid. If you are using a dense challah or raisin nut bread, judge for soaking as they may take about a minute to absorb the custard. Place the bread into the pan and cook for 4 to 6 minutes, lifting often with a spatula to check for browning. When the bottom is golden brown, flip with a spatula. 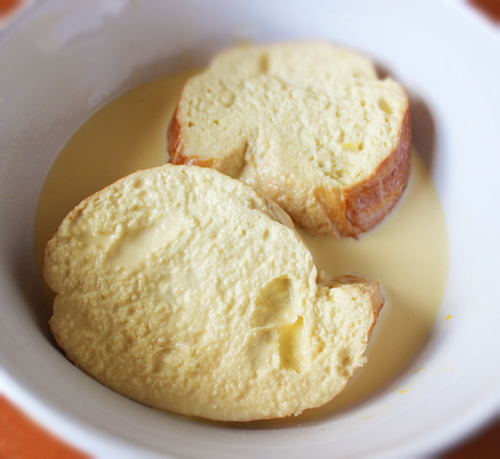 Soak the bread hearts in the custard very briefly, turning them with a fork. 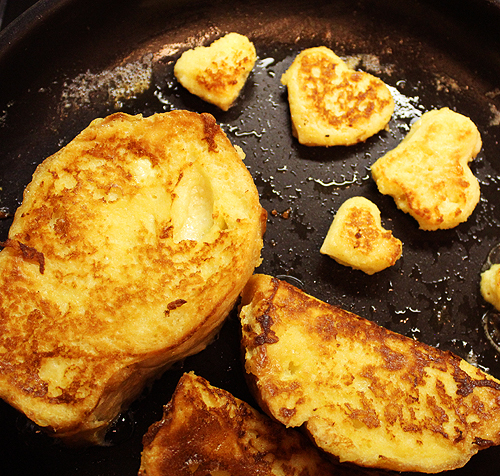 Place them in the pan, around the toasts. After 1 minute, turn the hearts. Cook for 1 more minute or until golden. Move the hearts to a plate, with the other toppings. When the toasts are golden brown, move them to plates. Have fun with arranging them. If you like, cut a couple pieces in half to triangles for more interesting shapes. 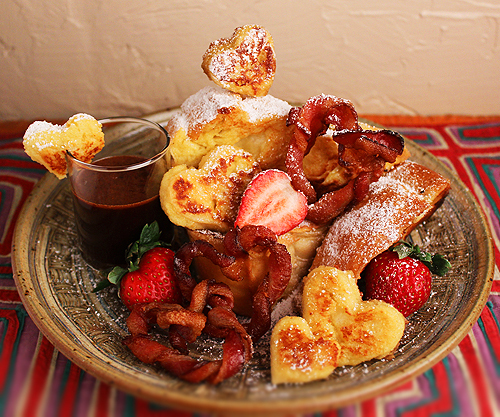 Garnish with the toast hearts, strawberries and bacon hearts. Sift powdered sugar over all, just covered but not full-on blizzard. Serve the warm syrup in a small dish on the side. Serve immediately.